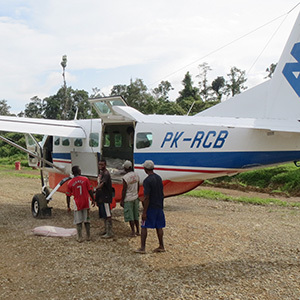 Not too long ago Papua was considered one of the world's last frontiers. Even as recently as the early 1990's aerial maps still showed blank, uncharted areas. The vast majority of runways have been built with primitive hand tools, and in many cases can still be considered "unimproved". With air strips carved out of mountain slopes or placed over filled-in swamps, this is a world far removed from the professionally-engineered runways you find elsewhere. 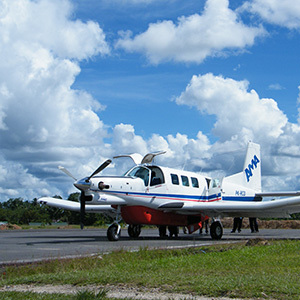 AMA operates a fleet of modern single-engine turbine aircraft that have proven themselves capable of handling the rough environment in which we operate every day. Our aircraft have the ability to switch between passenger and cargo configurations quickly and easily. The Cessna 208 Caravan is a single engine, turboprop, short-haul and utility aircraft, built in the United States by Cessna. The airplane seats up to nine passengers with a single pilot, and can also haul a large volume of cargo. The Caravan is used worldwide in remote regions. Equipped with the highly reliable Pratt & Whitney PT6 turboprop engine, the Cessna Caravan is AMA's aircraft of choice for operations into destinations with appropriate runway lengths. The Pilatus PC-6 Porter is a single-engine Short Take-Off and Landing (STOL) utility aircraft designed by Pilatus Aircraft of Switzerland. The PC-6 is noted for its STOL performance on almost any type of terrain and allows us to operate into airstrips under 900ft (280m) in length. 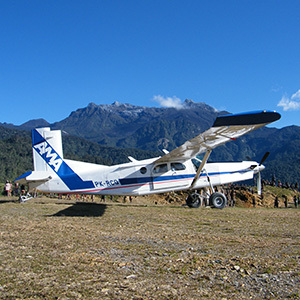 Due to these characteristics, the Pilatus is AMA's aircraft of choice for access to the shortest and roughest airstrips in Papua. With a payload and performance in between the Caravan and Pilatus Porter, the PAC 750XL fits nicely into our fleet. The plane is built in Hamilton, New Zealand, and is powered by a 750 SHP Pratt & Whitney Canada PT6 turboprop. For passengers, the cabin can be outfitted with up to nine passenger seats. The aircraft can be configured as all-passenger, all-cargo or a combination of both.